Following a jury verdict of willful infringement, the court granted plaintiff's motion for attorney fees under 35 U.S.C. § 285 because defendant's litigation conduct and positions were exceptional. "Regarding attorneys fees . . . Defendant simply argues that, 'reasonable or not,' it didn’t have an 'intent to deceive.' But this is not the test for evaluating . . . Section 285. Whether or not Defendant had an intent to deceive is a separate question from whether Defendant acted recklessly -- or worse -- in disregarding another’s patent rights under Section 284. . . . Defendant almost would have been better served if it hadn’t filed an opposition. Like its failure to produce experts at trial, Defendant’s Opposition evinces a lack of respect for Plaintiff’s patent rights and the litigation process. . . . Defendant maintained invalidity defenses through the course of litigation, only to completely fail to present any evidence to support those defenses at trial. Indeed, despite failing to include proposed jury instructions on invalidity and providing no evidence of obviousness, Defendant opposed Plaintiff’s Rule 50 Motion on Defendant’s invalidity defense. Moreover, as stated, the jury found that Defendant’s infringement was willful. . . . Here, based both on Defendant’s conduct during litigation and the jury’s unchallenged finding of willful infringement, the Court finds fees are appropriate." The court denied defendant's motion for summary judgment to preclude certain pre-suit damages for its anti-counterfeiting patents because there was a genuine dispute of fact whether plaintiff provided actual notice of infringement in a letter to defendant almost four years before it filed suit. "⁠[Defendant] principally contends that the letter failed to accuse specific products of infringement as required by Section 287(a). . . . Contrary to [defendant's] contention, [Amsted Indus. Inc. v. Buckeye Steel Castings Co., 24 F.3d 178, 187 (Fed. Cir. 1993)] . . . did not hold that Section 287(a) is not satisfied when the patentee notifies an alleged infringer of a 'type of product' that the patentee believes to infringe its patent. Rather, the letter that the Federal Circuit found inadequate in Amsted failed to accuse even the offering by any recipient of an infringing product or type of product. . . . [Plaintiff's] letter identifies [defendant's] film products 'that produce three dimensional images that appear to exist on a plane other than the surface of the film' and that [defendant] offered 'for packing and security label applications.' A reasonable factfinder could conclude that these statements provided a charge of infringement and sufficiently specific product identification for purposes of actual notice." The court granted defendant's motion to transfer plaintiff's patent infringement action from the Central District to the Northern District of California for improper venue and rejected plaintiff's argument that 28 U.S.C. § 1400(b) permitted venue in any district of defendant's state of incorporation. "⁠[Plaintiff] argues that venue is proper because the patent venue statute, 28 U.S.C. § 1400(b), permits an action to be filed in any district within the state of incorporation. Because [defendant] is a California corporation, it claims, venue is proper in any of the four districts within the state. [Defendant] disagrees and argues that venue is proper only within the judicial district in which a defendant has its principal place of business. This motion therefore presents a single, discrete question: In which judicial districts do domestic corporations 'reside' in multi-district states under the patent venue statute? . . . [I]n the context of 28 U.S.C. § 1400(b), a corporate defendant 'resides' only in the state of its incorporation and, within that state, only in the judicial district in which it maintains its principal place of business. Applying that standard to the facts of the instant case, Defendant is a resident solely of the Northern District of California." Following dismissal for res judicata, the court granted defendant's motion for attorney fees under 35 U.S.C. § 285 because plaintiff's litigation positions were exceptionally weak. "Plaintiff’s only argument that his infringement claim was not barred by res judicata was based on the theory that he could not have raised the claim in [its prior action] 'because Defendant was unaware of the patents-in-suit, and Defendant was incapable of knowingly inducing infringement without such knowledge.' This Court noted that because of the uncertain state of the law, Plaintiff had 'at least a colorable basis to allege the knowledge element of a claim for induced infringement based on the filing of the complaint.' Moreover, the record negated Plaintiff’s argument that Defendant was not aware of the patents-in-suit prior to [the prior action]. Therefore, the Court concludes that the weakness of Plaintiff’s litigation position, which borders on frivolous, demonstrates that this is an exceptional case." Following a stipulated judgment, the court granted plaintiff's motion for attorney fees under 35 U.S.C. § 285 because defendants' litigation tactics were exceptional. "Defendants’ reliance on [their counsel's] purported noninfringement opinion is particularly exceptional. . . . In a note specifically omitted from Defendants’ email to Plaintiff, [counsel] stated, '⁠[a] formal opinion is required, and that involves extensive study and other efforts to provide a reliable outcome. Please call me to discuss.' It would be one thing if Defendants simply received the email from [counsel] and purported to rely on it as an opinion of counsel. But the fact that Defendants removed [counsel's] disclaimer and copy-pasted the rest of [his] statements in an email to Plaintiff is more concerning. . . . The issue is not that Defendants failed to obtain a formal opinion of counsel, it is how Defendants conducted themselves in their interactions (or lack thereof) with Plaintiff regarding their alleged non-infringement positions. . . . With Defendants’ pre-litigation conduct and their conduct during litigation, particularly at the outset of litigation, there is strong reason to believe that this case could have been resolved amicably and early if not for Defendants’ actions." The court granted a British defendant's motion to dismiss plaintiff's patent infringement claims for lack of personal jurisdiction under the state long-arm statute. "⁠[Defendant] maintains that it has had no contacts with any individuals or entities in Florida, except with [one company], and it maintains that any business dealings with [that company] ended [5 years ago]. . . . Pre-issuance activity is generally irrelevant for purposes of determining personal jurisdiction in a patent infringement case. Because [plaintiff] did not submit any evidence supporting sales in Florida after issuance of either patent, the Court has no basis to consider sales to Florida in the minimum contacts analysis." The court denied defendant's motion to dismiss on the ground that plaintiff’s night vision patents encompassed unpatentable subject matter because the asserted claims were not directed toward an abstract idea. "At a high level, all four claims undoubtedly involve the idea of superimposition of images. But the Federal Circuit has admonished that just because the claims involve an abstract idea does not mean that they are directed to an abstract idea. . . . The patent claims minimize the manual recalibration by using the location comparison data to adjust how 'subsequent sensor-based locations are determined.'. . . Moreover, we are not persuaded by defendant’s argument that plaintiff’s claimed methods can be performed with just the human eye and a weapon scope. . . . Although the human brain is capable of matching images and evaluating differences, the . . . method claims recite a means of automatically and continuously performing the evaluation without the user needing to adjust the field of vision directly in front of her. . . . Because [plaintiff] did not stop at the concept of superimposition but instead provided a solution for achieving accuracy and consistency in image registration, plaintiff’s claims are not directed to an abstract idea." The court denied defendants' motion to compel the production of documents regarding plaintiff's communications with litigation-funding organizations that plaintiff withheld as privileged. "⁠[T]hese communications took place during a period when [plaintiff] actually and reasonably foresaw litigation. And, the evidence clearly establishes that these communications were primarily, perhaps exclusively, for the purpose of preparing for litigation. Defendants' arguments premised on the non-legal nature of Plaintiff's relationships with [redacted] are unavailing. Even if the Court were to fully credit this argument and consider the relationships to be commercial, the materials nonetheless fall within work-product immunity because they were communications with Plaintiff’s agents and in anticipation of litigation." The court denied plaintiff's motion for a preliminary injunction to preclude the sales of the accused fracking system because plaintiff failed to establish irreparable harm through loss of market share or reputation. "⁠[Plaintiff] currently has no share of the market for 'profile selective frac sleeves' because it has not sold any devices covered by the [patent-in-suit] in that identified market. Although [plaintiff] claims that it is developing a new product for the 'profile selective frac sleeves' market, it is undisputed that the new product at the time of the hearing had not yet reached the field testing phase. . . . [Plaintiff] has not shown a likelihood that continued sales of the [accused] system will have a negative impact on its reputation in either of the identified markets." The court denied defendant's motion for summary judgment on the ground that plaintiff’s soil sample tracking patent encompassed unpatentable subject matter because the asserted claims were not directed toward an abstract idea. "The Court agrees with the Defendant that soil sampling for the purpose of evaluating the nutritional deficiencies in a field is an abstract idea. However, the Court does not agree that a method for performing soil sampling is necessarily abstract. . . . The [patent-in-suit] purports to solve issues associated with existing techniques by coming to the end result more efficiently and accurately. Therefore, the Court does not find that the [patent] is directed to an abstract idea that is ineligible for patent protection." The court denied defendant's motion to dismiss on the ground that plaintiff’s patent for delivering targeted advertisements to a mobile device encompassed unpatentable subject matter because the asserted claims were not directed toward an abstract idea. "The [patent-in-suit] is not directed at merely the abstract idea of targeting advertising. Rather, it describes systems and methods for addressing barriers to certain types of information exchange between various technological devices, e.g. a television and a smartphone or tablet being used in the same place at the same time. To be sure, the end goal of the invention is to improve the delivery of relevant information -- i.e., targeting advertising (or other content) -- but that does not mean that it does nothing more than direct a person of ordinary skill in the art to use a computer system to implement a conventional and known process. . . . To the extent [defendant] is arguing that the patent does not adequately explain how the barriers are overcome when the described system and methods are employed, such issues do not support a finding of patent ineligibility under Section 101." The court granted defendant's alternative motion to transfer for improper venue because defendant did not have a regular and established place of business through its provision of equipment to customers in the district. "⁠[Plaintiff] also relied on [defendant's] 'business model' wherein [defendant], for the convenience of their customers, supplies its end use customers with [defendant's] equipment to be used at the customer’s facility. . . . This rather creative argument does not satisfy the test set forth in [In re Cray Inc., 871 F.3d 1355 (Fed. Cir. 2017)] for the simple reason that the equipment in question is not a place. . . . The fact that the equipment is moved onto the customer’s property, and may be removed by [defendant] or relocated by the customer with [defendant's] permission, precludes any finding that this equipment could serve as a physical, geographical location for purposes of demonstrating that [defendant] has a regular and established place of business within the district. Moreover . . . servicing a customer at the customer’s facility cannot transform that facility into the patent defendant’s place if the defendant does not hold such place out as its own." The court granted defendant's motion to dismiss all but three of plaintiff's patent infringement claims for claim preclusion, including claims for a patent that issued after the filing date of the parties' earlier lawsuit. "⁠[I]t appears that if a party acquires a patent infringement cause of action during the course of litigation, the party need not attempt to add that cause of action to the ongoing litigation or risk claim preclusion—even if the new infringement claim arises from the same transactional facts that prompted the ongoing litigation.⁠ . . . [T]he Court is confident that the Federal Circuit did not intend to draw a non-rebuttable line on the date that a party files its lawsuit, particularly where a later lawsuit attacks the same product or process at issue in an earlier lawsuit -- as is the case here. . . . [A] hard-and-fast rule that the filing of the original complaint ends the availability of claim preclusion could lead to significant, costly, and potentially unmanageable mischief. . . . [T]he Court holds that after-acquired claims, at least when they address the same, or substantially the same, subject matter as previously filed claims and when directed at a previously accused product or process, may be subject to claim preclusion under the Restatement’s pragmatic approach endorsed by the Federal Circuit. . . . [U]nder the circumstances [plaintiff] had a duty to move to amend (as it had already moved to amend to add an after-acquired claim) given that it would be accusing the same [defendant] products and processes, and that the [unasserted patent] was a continuation of a patent already in suit." The court granted defendant's motion to dismiss plaintiff's declaratory relief action for lack of an actual case or controversy stemming from defendant's proposed license agreement or litigation against plaintiff's customers. 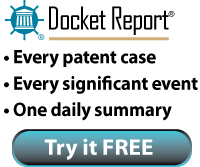 "Even if [defendant] did 'demand' that Plaintiff consider the license agreement it proposed 'to prevent [the initiation of] further patent infringement actions against [plaintiff's] customers,' as Plaintiff asserts, there is no indication of any discussion or threat of litigation against Plaintiff. Nor, drawing all reasonable inferences in favor of Plaintiff, do Defendant’s actions constitute an 'aggressive enforcement strategy' warranting a finding of subject matter jurisdiction here, as Defendant’s strategy 'appears to involve suing . . . users,' including [plaintiff's] customers, 'not . . . suppliers,' such as [plaintiff]." The magistrate judge recommended denying defendant's motion to transfer for improper venue because defendant had a regular and established place of business in the district through two offices that closed before plaintiff filed suit and one office acquired a year after plaintiff filed suit. "⁠[A]pplication of the rule proposed in [Personal Audio, LLC v. Google, Inc. (E.D. Tex. Dec. 1, 2017)] -- using the exact date of the filing of the Complaint -- is too rigid. No one disputes that the causes of action accrued while [defendant] had at least one office in this district, and the undersigned has already found that until [its] closure, such a presence was regular and established. . . . [S]ince [defendant] had a regular and established place of business in this district when the causes of action accrued, and [plaintiff] filed its Complaint within a reasonable time thereafter, the undersigned finds that this element is met as to [defendant]." The court granted in part plaintiffs' motion for monetary sanctions for their motions to compel discovery defendants withheld as privileged. "The Court has conducted three previous in camera reviews of documents that Defendants withheld, and each time, the Court has compelled Defendants to review their privilege logs and produce additional documents in accordance with the law. . . . As a result of Defendants' consistent sloppiness and noncompliance, the Court has expended a great deal of time reviewing exemplars, holding conferences, and preparing opinions and orders compelling Defendants to produce additional documents that were improperly withheld. Likewise, Plaintiffs have spent substantial resources seeking to obtain documents that should have been produced long ago." The court granted defendant's motion to dismiss for improper venue because defendant did not have a regular and established place of business in the district through its use of an online retailer's fulfillment centers. "Plaintiff does not present any evidence or legal authority to support its argument that the Amazon FCs are the physical, geographical location of [defendant]. . . . Plaintiff contends that [defendant] leases the place of business since it pays a storage fee to Amazon in exchange for storing the product. Plaintiff has not conducted a legal analysis demonstrating that a monthly subscription fee equates to leasing space in the FCs. On the other hand, Defendant has presented evidence that it has no control over which FCs its products will be sent, and once stored at one Amazon FC, Amazon has discretion to redistribute [defendant's] products to another Amazon FC. Since [defendant] has no control over its products once they are sent to Amazon FCs, these storage centers cannot be said to be the 'place of Defendant.'" The court denied plaintiff's motion for summary judgment that defendant's invalidity counterclaim was barred by assignor estoppel because defendant's founders were named inventors of the patent-in-suit and assigned plaintiff the right to the patent's application. "It is undisputed that [defendant] is in privity with [the inventors]. But the question remains, and the parties greatly dispute, whether [the inventors] assigned to [plaintiff] an invention that is claimed in the [patent]. The issue turns on whether the invention assigned by [the inventors] to [plaintiff] is different from or merely a narrower version of the invention claimed in the [patent]. Although assignor estoppel is an equitable doctrine for the Court to ultimately decide, these subsidiary factual disputes make summary judgment on the issue inappropriate at this time." The court denied plaintiff's motion for summary judgment that its lighting patents were not invalid for lack of novelty or obviousness due to IPR estoppel. "⁠[Plaintiff] contends that, any invalidity contention that [defendant] did disclose in its preliminary and supplemental invalidity disclosures must fail because [defendant] is estopped from asserting such contention in federal court under 35 U.S.C. § 315(e)(2), since [defendant] 'raised or reasonably could have raised' any such contentions in its IPR petition. . . . Some courts . . . reason that [Shaw Industries Group, Inc. v. Automated Creel Systems, Inc., 817 F.3d 1293 (Fed. Cir. 2016)] only requires excluding from the scope of Section 315(e)(2) those invalidity grounds for which the PTAB did not institute review, but not invalidity grounds that the petitioner failed to raise in its petition because the narrower estoppel suggested by Shaw would encourage petitioners to hold back 'a second-string invalidity case in reserve in case the IPR does not go the defendant’s way.'. . . . There is much appeal in a broader reading of the estoppel provision. . . . [But that] reading of the estoppel provision is foreclosed by Shaw. The Federal Circuit in Shaw held that the phrase 'during inter partes review' applies only to the period of time after the PTAB has instituted review, and notwithstanding [plaintiff's] claims to the contrary, that holding was not limited to Section 315(e)(1) nor was it mere dicta." The court denied defendant's motion for a temporary restraining order and preliminary injunction to prohibit plaintiff's enforcement actions, including posting takedown notices with online retailers, because defendant failed to establish a likelihood of success on the merits of its noninfringement and invalidity counterclaims. "⁠[Defendant] provides no evidentiary support of its proposed claim construction to support such a narrow claim construction that would exclude several preferred embodiments. . . . [Defendant] has not provided the Court with any evidence of how a person of ordinary skill in the art would apply the references to the asserted claims to render the claims obvious. . . . [With respect to its invalidity counterclaim based on lack of enablement and written description, Defendant] fails to provide the Court with any indication of how those skilled in the art would read the patent at issue. . . . [With respect to its invalidity counterclaim based on anticipation, Defendant] has provided no evidence regarding when [plaintiff's] first public disclosure or sale of the invention occurred. Instead, [defendant] appears to be relying on an assumption that it will ask for and receive a spoliation instruction from the Court because of alleged destruction of evidence. But [defendant] cannot use this form of speculation to show a reasonable likelihood of success on the merits that the patent is invalid for prior public disclosure." The court denied defendant's motion for a new trial because defendant was not prejudiced by the court questioning defendant's damages witnesses at trial. "⁠[Defendant] believes that the Court expressed disdain for its positions in front of the jury, coloring their evaluation of the evidence despite an instruction not to take anything from the Court’s comments during trial. . . . [Defendant's expert] reiterated that the 20 Amp Limitation is 'just a test specification. No tool actually does that.' The Court responded, 'Understood, but that’s what patents are all about.' This lone comment, even if it could be seen as disparaging [the expert's] opinion, was not prejudicial. The Court’s one-liner did not unravel the prior thirty minutes of questioning. . . . The Court did accuse [defendant] of 'flailing in the wind,' but this was no more than the Court’s suggestion that the point had been made and it was time to move forward. . . . The trial record was replete with evidence supporting the jury’s damages determination, and the Court’s few comments and questions had little, if any, effect in the grand scheme." The court transferred plaintiff's patent infringement action in response to defendant's motion to dismiss and rejected plaintiff's argument that defendant's venue challenge was untimely. "⁠[Defendant] concedes that its motion came six months after [TC Heartland LLC v. Kraft Foods Group Brands LLC, 137 S. Ct 1514 (2017)], but the delay was due to the fact that other courts interpreted TC Heartland differently. There was a district court split over whether a challenge to venue was waived if the moving party delayed in raising this issue. . . . Once the Federal Circuit issued its opinion in [In re Micron Technology, Inc., 875 F.3d 1091 (Fed. Cir. 2017)] holding that 'TC Heartland changed the controlling law,' [defendant] filed the instant motion within a week. . . . To hold that [defendant] was required to immediately file its change of venue motion after TC Heartland was issued, but prior to the definitive guidance in Micron Technology, when the only law in this circuit at the time held that TC Heartland did not change the law, would be patently unfair to [defendant]."